Wild radish is a non-native plant that is considered invasive. It is an early-spring bloomer, dotting the fields with color beginning in January and extending up to July. Its light-colored flowers can be white, pink, purple, blue or yellow, and it is not uncommon to see multiple colors on one plant. 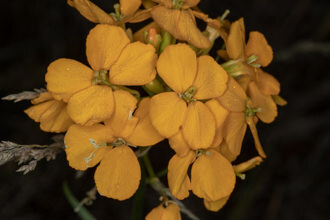 The flowers are about an inch in diameter, have 4 veined petals, and appear on short stems offshooting from the main stem. The seed pods grow to about an inch long. Its leaves are rather large, fleshy, and toothed, with short hairs covering both the foliage and stems of the plant. Like the cultivated garden radish, it has a tap root that becomes woody as flowers appear on the plant. 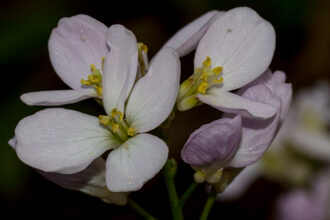 A close relative is Raphanus raphanistrum, which is also called wild radish. Raphanus raphanistrum is thought to be the ancestor of Raphanus sativus and as such is perhaps more deserving of the common name of 'wild radish', whereas Raphanus sativus might be described as the common garden radish gone-wild. Raphanus means "fast appearing" refering to the rapid seed germination, and sativus means "sowed", indicating its cultivated nature. Last modified: May 12 2017 16:41:13.